A native of the Caucasus region, also cultivated and rarely escaped to roadsides and yards. First collected in 1898 in Jackson Co.
Intermediate plants with ± prickly stems (though perhaps the prickles fewer, straighter, and/or less flattened), with calyx intermediate (ca. 4.5–7 mm long at anthesis), and sometimes with ± decurrent leaves are apparently the hybrid S. ×uplandicum Nyman, which is more common than pure S. asperum. 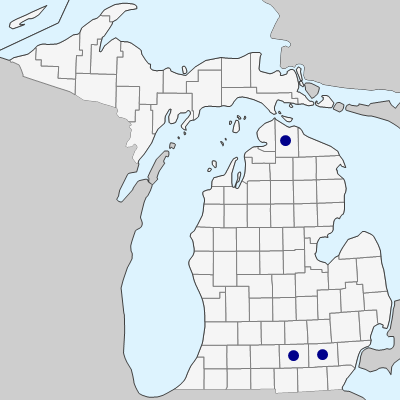 Specimens referable to the hybrid are known from Cheboygan, Gratiot, Ingham, Iron, and Washtenaw Cos.
MICHIGAN FLORA ONLINE. A. A. Reznicek, E. G. Voss, & B. S. Walters. February 2011. University of Michigan. Web. April 19, 2019. https://michiganflora.net/species.aspx?id=596.